Description: 3751 displayed in Viaduct Park. This is the beginning of the restoration of 3751. Date approximate. Description: 3751 displayed in Viaduct Park. Note the removal of lagging forward of the cab. Date approximate. Description: 3751 displayed in Viaduct Park. Looks like all the lagging has been removed. Note Virginia Slims billboard in the background. Date approximate. Description: 3751 displayed in Viaduct Park. Looks like all the lagging has been removed. Date approximate. Description: 3751 VIADUCT PARK 12-85. Are they getting ready to move it??? Notice stripped headlamp. Description: 3751 VIADUCT PARK 12-85. Are they getting ready to move it??? Description: In December 1991, Santa Fe #3751 backed out of California Steel Industries after a five year restoration and onto the Pasadena Subdivision mainline at Fontana for its first short test run west to Upland and return. What a sight! Description: ATSF 3751 westbound at Bena, CA. 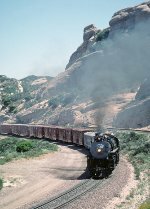 Description: Under a breathtaking sky, Santa Fe 4-8-4 3751 and its train speed east across northern Arizona and passes under one of the Santa Fes iconic signal bridges as it approaches Seligman on August 31, 1992. The Santa Fe Employee Appreciation Special is heading from Los Angeles CA to Chicago IL. Description: Good steam engine firemen pride themselves on a clean stack, and as Santa Fe 4-8-4 3751 speeds eastward across northern Arizona, the fireman is doing an exemplary job. 1992 was a banner year for this Northern, as it operated on its longest trip since being restored to service a year earlier - Los Angeles, California, to Chicago, Illinois, and return for a series of Santa Fe employee appreciation trips. The engine is seen here at Yucca, Arizona, on the last day of August 1992. Description: ATSF3751 leads the employee appreciation special to Chicago. Description: Santa Fe 4-8-4 3751 blasts through the Green River Golf Course, just west of Prado Dam, between Corona and Yorba Linda, California, on train O-SBDLAC1-12. The locomotive was moving from its old home in San Bernardino to its new home in Los Angeles, and hauled a short freight en route - primarily for the braking capabilities. Description: Headed to Railfair'99 in Sacramento, the grand old Baldwin puts on the best steam show I'd ever seen, ripping through town at high speed. The train was officially BNSF OLACSAE13 RailFair'99 Special. 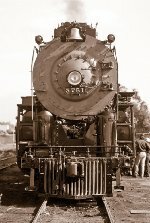 #3751 was the ATSF's first ever 4-8-4 Northern (thus, the 3751 Class engine on Santa Fe), having been delivered by Baldwin Locomotive Works in May 1927. Description: Santa Fe 4-8-4 3751 blasts past a crowd on the platform at the station in Fullerton, CA, on June 13, 1999. The train, O-LACSAE1-13, is heading to Sacramento.